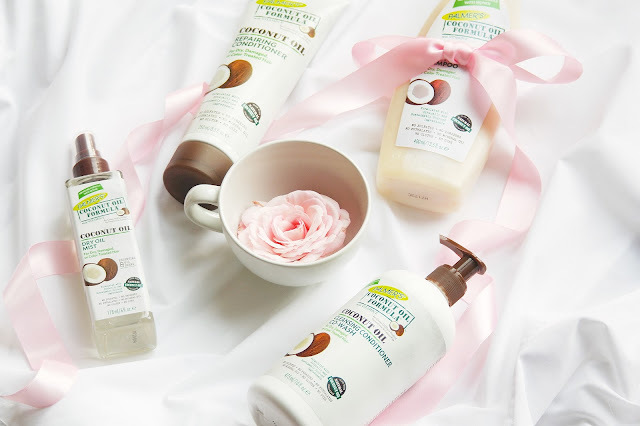 During the summer when it comes to my hair or skin there are certain scents that I gravitate towards, and coconut being one of them. I sure I am not the only one who thinks this too. So over the last few weeks I have been getting lost in the scent of coconut and imagining I’m on an exotic island. Well, one can wish. So for now I will have to settle on using Palmer's Coconut Oil Formula Range which is just something else. I have been using a couple of products from the range and I must say I am very impressed and the fact that they are very budget friendly makes them even better. I am pretty sure that you have come across Palmer's at one time or another as they have a wide range of products that can tackle different areas of within the beauty world. Ranges such as Skin Success, Shea Butter Formula, Olive Butter Formula, Coconut Oil Formula, Olive Oil Formula and Hair Success. Their pregnancy range is something that I used religiously when I was pregnant with my daughter, especially their Cocoa and Shea body butters as well as their lotions and oils. And so I am very excited to share a little about the Coconut Oil Formulas treats I have been using. Every now and then we have to make time for a little deep conditioning. Deep conditioners or hair masks are an essential part of a healthy hair care routine, whether you're natural or not, and no matter your curl type. And yet, so many people don't know how to properly deep condition their hair, or neglect the practice altogether! However, with this Coconut Oil Deep Conditioning Protein Pack you can treat your hair to a little extra nourishment in one simple step. This protein pack is jam packed with vitamin E and is a great way to kick start a deep conditioning. This little pack certainly packs a punch and smells absolutely amazing, it restores and replenishes dry, damaged hair with coconut milk, keratin & silk protein. I have naturally wavy, thick hair. So it literally can't handle any kind of heat without frizzing. So any kind of conditioner that comes my way, I'll use every last drop! The texture was thicker than my regular conditioner and it definitely smelt like coconut oil! I could feel that it was helping to smooth down my ends. However, once dry, my hair did feel heavy. It seemed to be greasier and certainly needed a wash quicker than usual. I think on my next use I will use less product in the hopes that it will nourish and replenish my hair without leaving a heavy and greasy feeling. Palmer's Coconut Oil Formula Coconut Oil Conditioning Shampoo is a rich, creamy shampoo, free of sulfates and harsh detergents, that gently cleanses and removes buildup without stripping hair or interrupting it's delicate moisture balance. This one is particular great for battling those with dry, damaged or colour treated hair, which is just what I need with my thick, wavy and frizzy hair. I use this shampoo every time I wash my hair! It is conditioning and leaves my hair feeling and smelling amazing. It is paraben and sulphate free which is a bonus for me. It works well on keeping my hair colour fading and it's good to use on longer hair length. It lathers reasonably well and leaves my hair feeling clean and the scent really lasts in your hair. Just in case you are not familiar with the concept of co-washing, let me briefly explain. As you can imagine co-washing is just as it sounds, washing the hair with conditioner only. It means skipping shampoo and relying solely on conditioner, whether you’re a daily or a weekly washer. The result is something between squeaky-clean and second-day hair that is, smoother, softer, and easier to manage. For those with textured or drier hair, it can make all the difference. By co-washing it can make the hair more manageable, easier to comb and of course be softer. This lightweight, sulphate-free cleansing conditioner delivers all I expected co-washing to be and then some. It gently removes any product build up, oil and general dirt, all the while leaving my hair beautiful. This co-wash doesn't lather up as much as a traditional shampoo, and this has a gorgeous and exotic coconut scent. The texture of the product itself is pretty thick and is super easy to apply to the hair. At first I was a little put off with using the co-wash as I wasn't too sure what to expect, as the product looks super thick and I didn't want it to leave me with a product heavy feel to my hair. But I was impressed, this little bottle of cleansing conditioner co-wash has really opened up my eyes to the whole co-washing idea. If your hair is in need of a major moisture boost, then you really need to try this repairing conditioner which is a blend of hydrating coconut oil with Tahitian monoi to rejuvenate dehydrated hair and bring your strands back to life. Plus, the creamy formula coats each strand for a silky-smooth, detangled finish. After a few uses I really started to see a difference. It doesn't dry out my hair which some tend to do afterwards combing my hair out. It smells so good. My hair is very thick, dry, and damaged. So I am on my way to recover my hair and I feel like this product will continue to help my hair a lot by adding shine and strengthen. I've tried countless different types and combinations of shampoos and conditioners on my hair and it still remains really frizzy and dry feeling. But using this once a week has really helped me battle the frizz and leave my hair feeling super smooth, replenished and definitely nourished. This Coconut Oil Formula Weightless Shine Dry Oil Mist is a lightweight, moisture-rich spray combines the strengthening power of keratin protein with the blend of 8 Essential Hair Oils. Raw Coconut Oil, Jojoba Oil, Amla Oil, Avocado Oil, Argan Oil, Passion Flower Maracuja Oil, Grape Seed Oil, and Kukui Nut Oil. 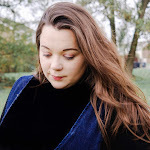 I always a little wary about using oils and mists in my hair, as I have used some that have been far too heavy for my hair and did nothing for me. 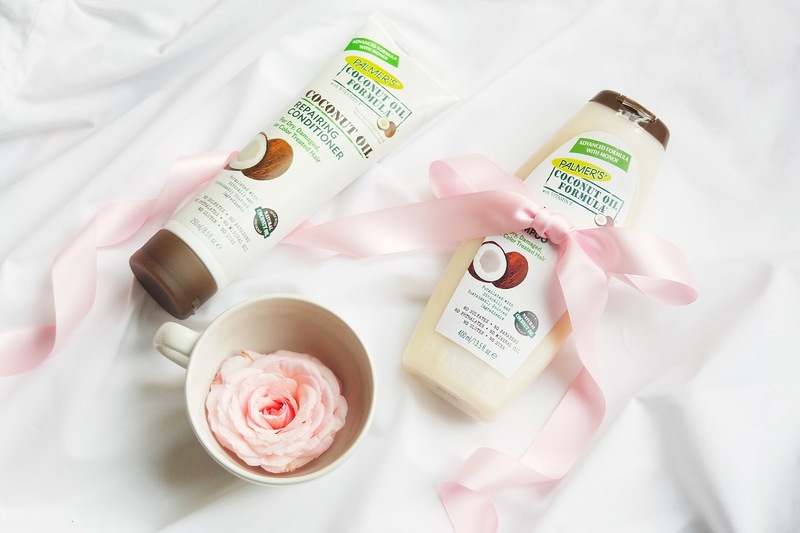 And like the other products in the coconut oil formula range this one smells just as good. With this oil, a little goes a long way and it leaves my hair looking nourished and so shiny. This is one product that I will definitely be keeping in my hair care routine and I have noticed a difference when I don't use it! In a nutshell, the Coconut Oil Formula treats are something else, I am genuinely impressed with the results. I'm not too sure if I would use the hair mask as much, perhaps a monthly thing. But nonetheless the range is great and one that I will be keeping in my hair care routine. 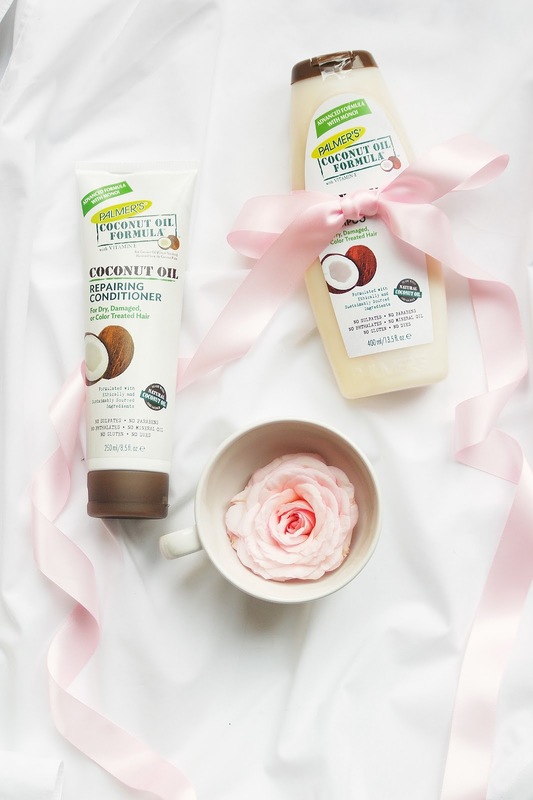 Are you familiar with the Coconut Oil Formula range? If so, do you have any products you'd recommend? 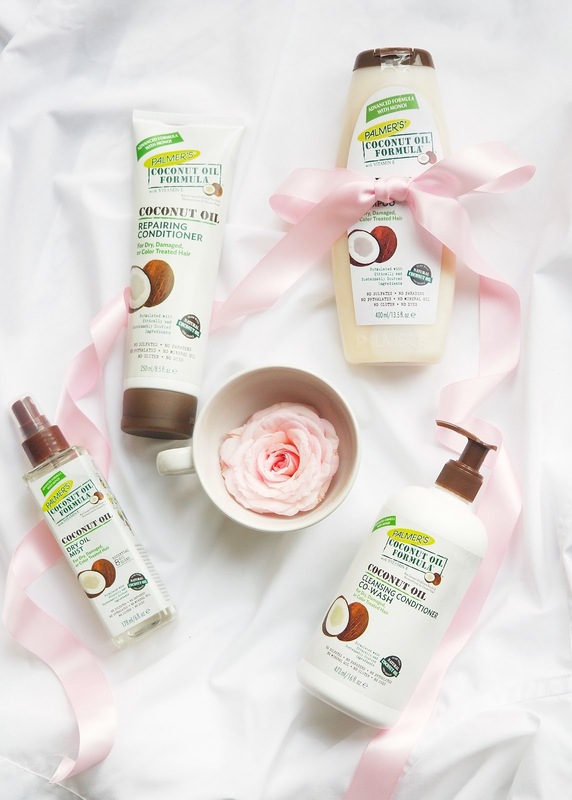 5 comments on "Palmer's Coconut Oil Formula Hair Treats "
I love coconut in the summer too, my hair is so dry at the moment I think I need to give this a go! These sound amazing, my hair is so dry so I am definitely in need. BIRCHBOX - August 2018: Live a Life Beautiful.